Ever since I did the research for Opération Séduction, I longed to visit Philadelphia so that I could eat in XIX, the restaurant at the top of the Bellevue building. 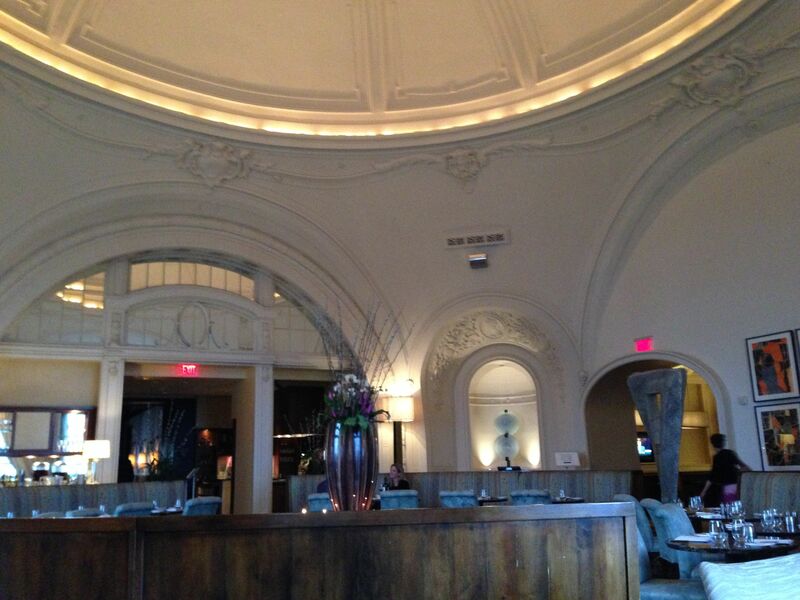 In my story it was the model for Maxime’s, Peter Noel’s favored venue for seduction. I am fond of rooftop bars and restaurants. They make for highly romantic adventures. Therefore I had planned to take the Long Suffering Husband to XIX when he arrived for the weekend. Unfortunately, when I reviewed the menu, I realized that it’s the kind of place where vegetarians struggle to find something to eat. Even the salads have meat or anchovies. So I made a reservation for us at Amada (a very good choice, on which more in another post). The glorious Bellevue building on a day worthy of Maxfield Parrish. Still, the historic structure on Broad Street kept whispering its siren song. 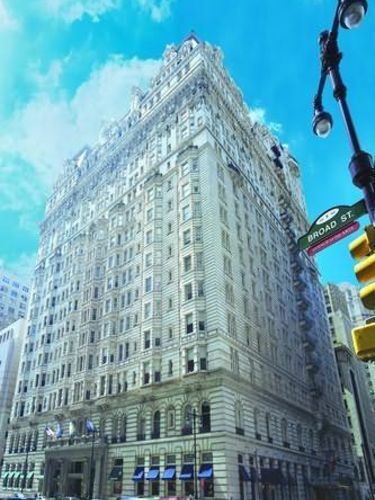 It was built in the French Renaissance style in 1904 by George Boldt (who also managed the Waldorf and Astoria hotels in New York). 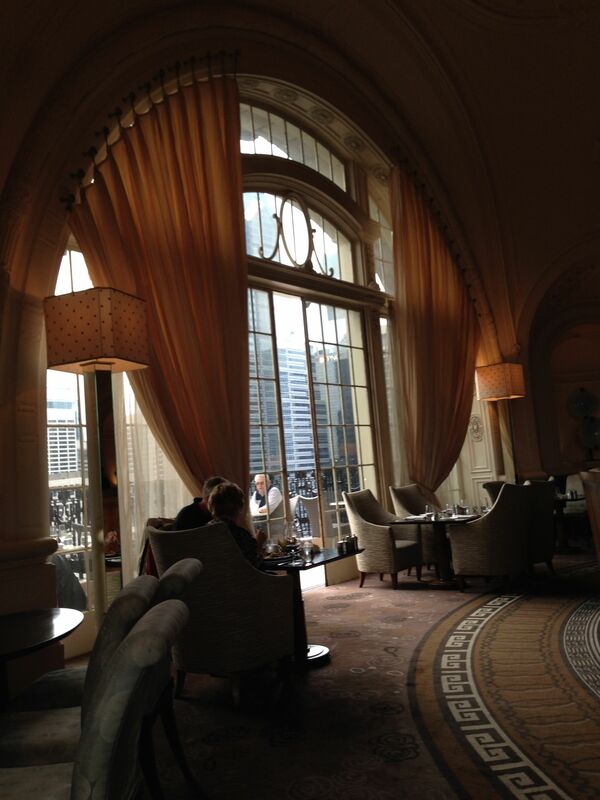 No expense was spared: there were light fixtures by Edison, windows by Tiffany, chandeliers by Lalique. Every US President since Teddy Roosevelt has visited the Bellevue. Its charms still enthuse lovers of old-time skyscrapers (from the days when nineteen stories was very impressive). An old postcard with the cream of Philly society rocking out on the rooftop of the Bellevue. As for the top floor, I had to see whether XIX matched my mental image of Cynthia and Peter’s first date. I would go on my own, and as for the food–well, I would manage somehow. My initial impression was disappointing because the dining room did not have the famed pearl chandelier. There are actually two dining rooms separated by a small but elegant bar. The chandelier room is used for special events and (as I later discovered) for brunch. A first look at the dining room. Remodeled in the 1990’s, XIX could use an update in my opinion. The rug is a dingy brown pattern which does nothing for the space, and the wood banquette is scratched and dull in places. It’s in need of some loving care. On the other hand, the alcoves have a beautiful lining of translucent, pearly mica, which hides the light sources behind. And the dome with its moldings and stained glass aperture feels like the roof of heaven. After dark, this must be a stunning place in which to find oneself, especially when accompanied by a Beautiful Man. Are you feeling the romance? The server brought me a glass of Chilean Sauvignon Blanc which tasted subtly wrong, as though the bottle had been sitting out for a day or two. One thing I do not expect in an SB is a funky foul aroma. Grass I don’t mind, and I have even been known to allow a soupçon of cat pee. But gym shoe/raisin is a combination up with which I will not put. I don’t usually send wines back, but finally I asked for the wine list to order something else. I ended up with a good chardonnay, which the server let me taste first. And she didn’t charge me for the rejected glass… a plus! Next came some good bread and (since the salads were not vegetarian) the only meatless starter on the menu, a rustic soup of tomato and white beans topped with basil pesto. 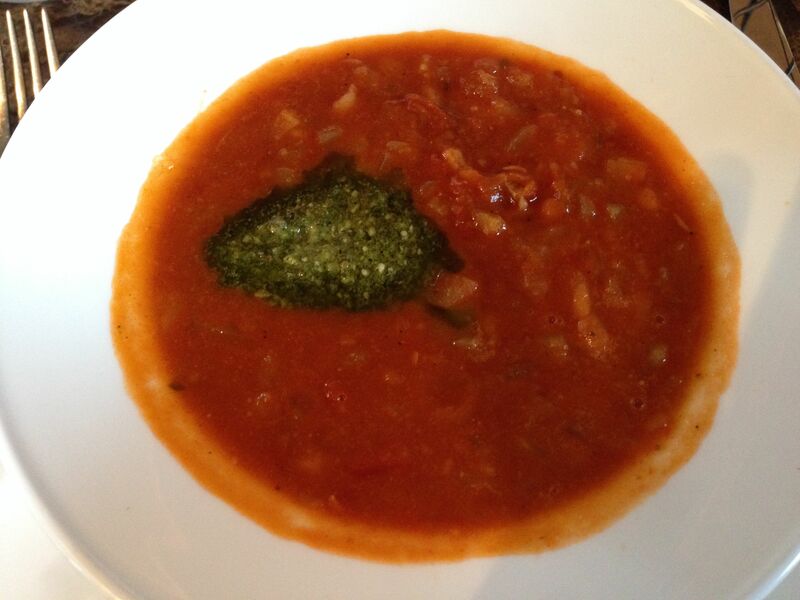 This was a very creditable soup with a homemade taste and lots of tomatoey tang. I was expecting something more sophisticated, but I have no complaints. White bean and tomato soup. XIX is the kind of place that tolerates vegetarians rather than actively discouraging them. Many restaurants do this. They have a token meatless dish on the menu in case someone in the party is a vegetarian. If a pair of vegetarians arrive for dinner, they are forced to eat the same thing, which is no fun unless you are in the hands of a genius, working your way through an inspired tasting menu. 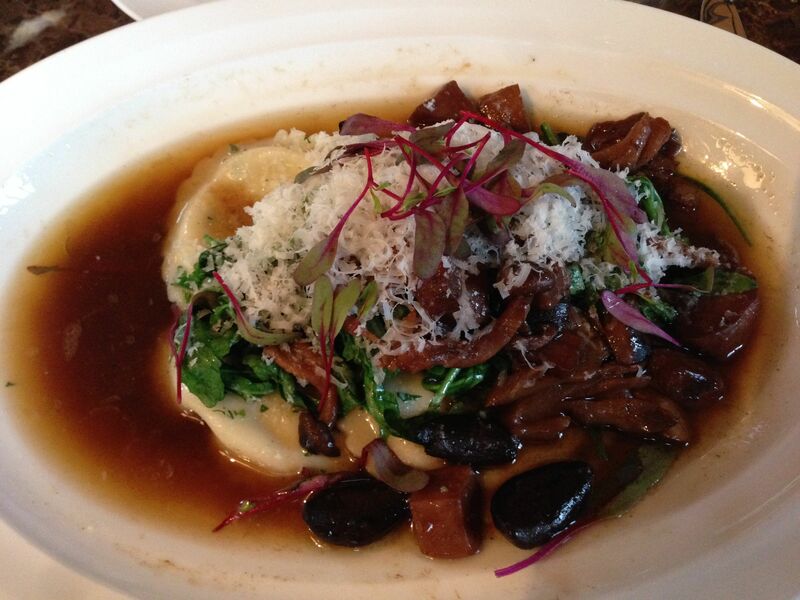 The token offering at XIX was lemon ricotta ravioli with brown butter and wild mushrooms. I thought it sounded a bit odd. But I didn’t have much choice. Lemon ricotta ravioli in mushroom sauce… food for thought. I must say, this is one of the strangest dishes I have ever eaten. It inspired a great deal of cogitation on what the chef might have been smoking that day. The ravioli were presented in a deep pool of browned butter sauce redolent of wild mushrooms. This was a very pungent sauce. (It reminded me of my childhood, when one of my favorite foods was a roast beef sandwich au jus, with plenty of dark rich jus.) On the side were some salty black olives (this dish was very salty). On top were wilted greens. Had the ravioli contained something complementary, like winter squash or potato or even a roasted cauliflower purée, this could have been a huge success. But instead, they were filled with a slightly sweet, light, very lemony ricotta. It was just wrong. There were too many impediments to this marriage. I can image the ricotta served with a drizzle of warm lemony vinaigrette, or perhaps sitting atop a judicious amount of lemon-zested butter–with non-wilted, very fresh baby arugula on top, and some shavings of Reggiano. That would be a good dish. At any rate, I made an effort. I ate most of the mushrooms and greens, and left most of the ravioli. The whole time, I was mesmerized by the bizarre acoustics of the space. Within the circle of the banquette, but thirty feet away on the other side of the room, was a couple enjoying (I hope) their dinner and having a conversation. Their speech was easily audible to me. It sounded as though a microphone was planted on their table and the sound was being piped directly to a spot about four feet away. Had I known of this fantastic property of XIX, I could have written a whole different storyline, in which naughty Peter enticed his amours to describe their past sexual adventures, while Leslie ecstatically eavesdropped, savoring a glass of Prosecco. Probably there is no danger on a busy, noisy evening, but if you ever happen to visit XIX, be careful what you say. A couple of days later, it was a Sunday. The LSH and I were desperately seeking a place open for lunch and within walking distance. None of the vegetarian places was open, so I got the idea of trying a brunch. At XIX, which was right around the corner. 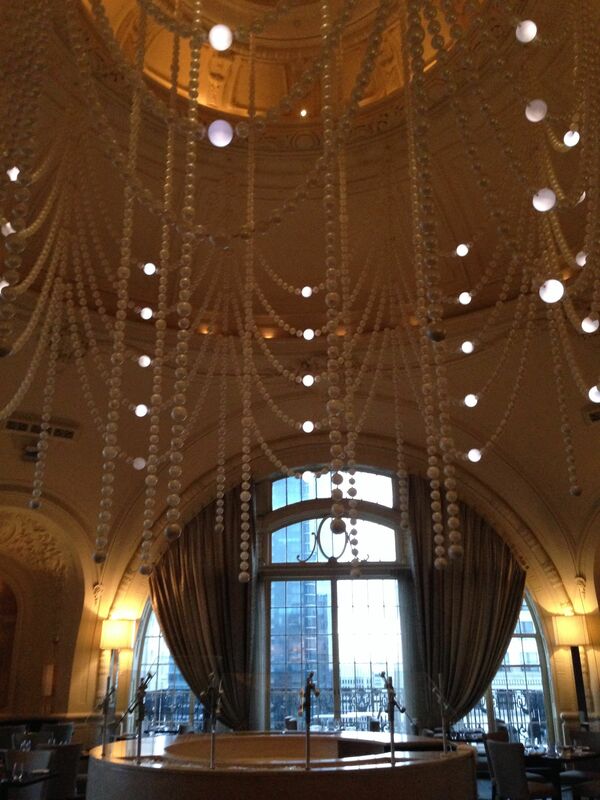 Brunch is served in this room with its over-the-top drapery of huge pearls. I loved it. This is definitely the room in which Peter worked his magic. And did we get enough to eat? Oh yes. They had several salads, a board of cheeses, and pastries, not to mention the main dish, which was once again a single token item. This time it was quite tasty (if incredibly slow to arrive), a wrap of black beans and quinoa with spicy chipotle mayonnaise. We washed it all down with mimosas and received a free refill (heavy on the champagne) to make up for the slowness of the kitchen. 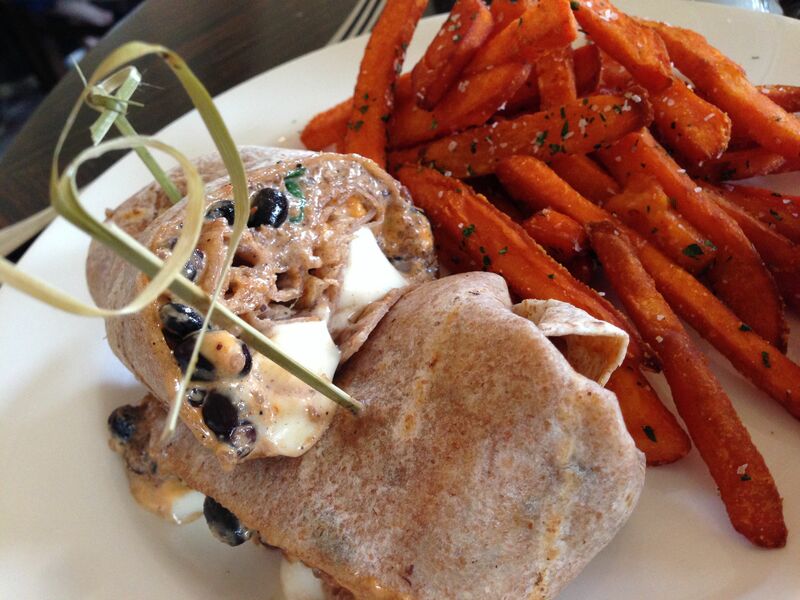 Black bean wrap with sweet potato fries. Very good, and quite spicy. Would I go there again? I’m not sure. Probably I would stop in for a drink, sit in the bar, and relish the view from the nineteenth floor. Yes, a good thing about the drinks! Otherwise I would have had a much more negative attitude. But there is definitely something magical about the space. What a fantastic building. I’m glad you got to see the pearl chandelier on your second visit. p.s. good for you for sending the questionable SB back. Life is too short to drink bad wine. Wait, you were in Philly? Yes, I was there for an antiquarian book tour. We went to places like The Library Company and the PA Historical Society. It was amazing! Hey 🙂 nice post, BTW…haven’t seen you around my blog lately…what have you thought of my recent posts? I’m sold on XIX! 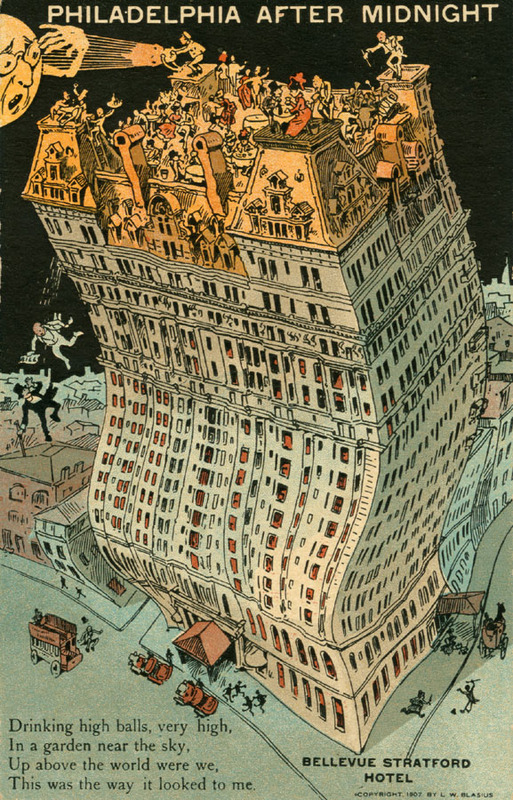 I appreciate that it has lost some of its luster but that goes with a hotel over a hundred years old. I can imagine that the powers that be are fine with just a few changes. Totally old school. And I love that vintage postcard! Thanks! Once I saw that postcard, I had to include it. It brings the history of this glorious old building to life and it’s a wonderful piece in itself. This place would be my cup of tea if it weren’t for what sounds very substandard dining. Love the history of the place, for sure. So I would go and just sit at the bar, as you’ve said. But oh lord, “gym shoe/raisin,” that sounds hideous. That cat pee note has been in your discussions before, which is mortifying as well. I hope I never encounter anything that remotely resembles those notes. *shivers* But the food presentation you have there really does look appetizing. Too bad it falls short.